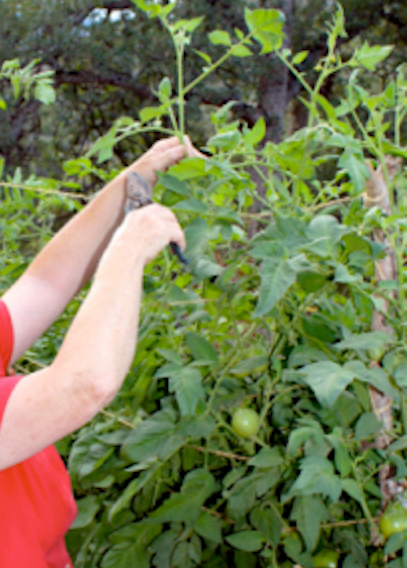 Pruning tomato plants helps them produce earlier in the season. Tomatoes can be stronger, bigger, and healthier. When tomato plants are both pruned and staked, their chances of contracting diseases are reduced because leaves and stems stay drier and allow for more circulation. Simple pruning means pinching young suckers between a main stem and a side stem. (Learn more about simple pruning. 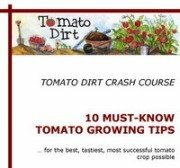 )There are other ways to pruning tomato plants successfully, too. Try these. Missouri pruning reduces shock to the plant. It’s especially helpful for those in hot, sunny climates or when suckers have gotten large. The downside of Missouri pruning is that remaining suckers will grow new suckers. Carefully monitor plants when you prune sucker tips only. What is “root pruning” and when should you do it? Some gardeners like to strengthen tomato plants is by pruning the roots. Cutting the roots interrupts the plant’s growth cycle and stresses it enough to force it to mature more than it would otherwise. A good time to root prune is just as the first few clusters of tomatoes ripen. Insert a long kitchen knife, pitchfork, or a spade a few inches from the base of the plant, penetrating the soil 8-10 inches. Make your cut just halfway around the plant. At the end of the season, tomatoes on the vine have only a short time to ripen. You can help plants maximize this time. About a month before the last frost, clip off the top of the plant’s terminal shoot above the last blossom. (Make sure you use a high-quality set of garden pruners.) This technique is called “topping the plant.” It allows the greatest amount of nutrients to be directed to the fruit to give you the best production at the end of your crop. When you top your plant, you’ll have a better chance of a final harvest of red tomatoes rather than green. Get more pruning tips on our Pruning Tomatoes Pinterest board.